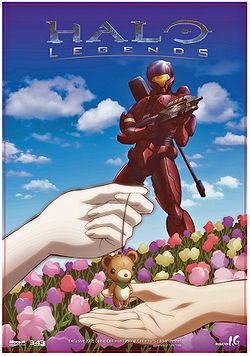 Homecoming is one of the seven short films comprising the anime adaptation of the Halo universe, Halo Legends. Homecoming focuses on the tragedies involving the SPARTAN-II conscription in 2517, and the supersoldiers coming to terms with their origins. Like all Spartan-IIs, Daisy is abducted as a child and placed into the training and augmentation program. A few weeks after the augmentations, she, Ralph-103, Joseph-122, Oscar-129 and another unnamed Spartan hold their trainers at gunpoint, before being granted permission to leave by Dr. Catherine Halsey, the creator of the Spartan-II project. The Spartans escape Reach and go their separate ways, with Daisy returning to her home planet of Sargasso. Later, during a battle on a war-torn world in the Human-Covenant War, Daisy-023 assists several Marines that had been pinned down by enemy fire. As she assists the Marines in reaching an evacuation point, she encounters Ralph-103, a fellow escapee who is now working as a Marine. As the evacuation Pelican dropship lands and the Marines board the vessel, Daisy is impaled by Needler rounds. She unsuccessfully attempts to provide covering fire using a pistol; the Pelican is completely destroyed with Fuel Rod Gun fire, killing everyone aboard. Daisy dies soon after from the Needler rounds. Joseph Chou was inspired by Eric Nylund's novel Halo: The Fall of Reach which detailed the background of the Spartans. After discussing story ideas with Shinji Aramaki they decided to create a story about a group of Spartans that escape and ultimately one who faces their self. The story was taken to Production I.G for development where it was presented to director Koji Sawai who had worked for Production I.G in the past including work with Mamoru Oshii. I.G President Mitsuhisa Ishikawa chose Sawai for his known ability to portray females in a very strong way with both affection and beauty. Sawai, who is presently a director for Bee Train Productions Inc., (a former subsidary company of I.G) along with his friend Koichi Mashimo brought in their own team of artists and animators including long time writing collaborator Hiroyuki Kawasaki. Sawai's objective was to bring the studio’s own unique style and flavor with their best staff to the episode and the entire Halo Universe in the time allowed. While all promotional materials cited Production I.G as the producer of Homecoming, the official video release credits Bee Train to the principal animation work, with studio head Mashimo acting as the executive producer. He was also given credit as being the director in the promotional materials and by the website. In their audio commentary Frank O'Connor and Joseph Chou mentioned the anime style is strikingly contrast to the story. While the story is quite dark the color pallet is very bright and traditional anime style. Chou also expressed interest in making a story similar to Homecoming, but focusing more on the broader SPARTAN-II Program itself, more faithful to the depiction in The Fall of Reach, rather than the individual characters that were only a side part of it in Homecoming. The introductory narration states that humanity had established the Inner Colonies in the "heart of the Milky Way" by approximately 2310. This is physically and technologically impossible, as the galactic core is extremely dense and is theorized to contain a supermassive black hole. In actuality, the entire human sphere is contained within a relatively small volume inside the Orion Arm. The manner in which Daisy's M6 sidearm is holstered is physically impossible, since the handle and trigger guard occupy the center portion of the weapon, yet the holster appears rectangular, with no slit at the back for the handle. The fact that the rear iron sights are visible prove that the handle was not exposed at the opening. The holster itself appears to be suited for pistols with a design similar to those of modern pistols, with the handle closer to the hammer. In the episode, Dr. Halsey calls Daisy by her SPARTAN tag number, "Twenty-Three". Typically, Dr. Halsey calls the Spartans by their real names, though she criticizes herself for doing so as she believes that she can not become too attached to the subjects. During Daisy-023's first flashback, a Halo can be seen in the sky, despite the scene taking place on Reach. According to a series of "trading cards" posted on Facebook as part of a promotional campaign for Halo Legends, the battle in Homecoming takes place on Harvest. However, the same cards also erroneously claim Harvest is Daisy's homeworld, and have other mistakes, such as spelling Sergeant Hauser's name as "Howser". In addition, the planet is shown to have moons in Homecoming, whereas Harvest has no natural satellites. The site of the battle in the episode also has a number of visual allusions to Daisy's flashbacks of her homeworld, which could imply the scene takes place on Sargasso and would thus date the battle as late as 2546. This is supported by the opening narration, which states that the Outer Colonies are already gone at the time, implying the episode takes place after 2535. Whatever the case, Jeff Easterling has stated that 343 Industries have chosen to leave the setting vague for the time being.